In the wake of the last year’s live action remake of Disney’s Beauty and the Beast, the stage version, unsurprisingly, has become a popular choice for schools and community theater groups this spring. Movie aside, it’s a solid choice as one of the most well-received Disney musicals, with a classic Alan Menken score made up of both songs from the animated movie and new songs that fit right in, a blend of comedic and more tender moments and an opportunity for the creative team’s talents to shine. 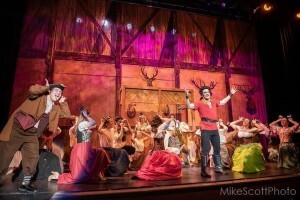 Amidst the crowd of beauties and beasts this season, be sure not to overlook Shining Light’s production at the Stadium Theater as another example of the incredible work consistently done there. The tale, of course, is as old as time, and most audiences will be familiar with the 1991 animated film: a booklover from a provincial French town takes her father’s place as a beast’s prisoner in an enchanted castle. As the beloved Disney princess, Belle, Lisa Ziniti Palmer is both sharply intelligent and stubbornly strong-willed, standing up for herself against beasts and beast-like men alike. Her gorgeous soprano vocals captivate the audience in the songs “Belle,” in which she confesses her desire for adventure despite how odd her neighbors believe her to be, and “Home,” in which she contemplates her new life as the Beast’s captive and mourns the life she had previously longed to escape. Opposite her is Brandon Michael as the Beast, a cursed prince with some anger issues. As the ruthless master of the house, his presence is formidable and frightening, but becomes more kind and sympathetic under the influence of Belle and his servants. The turning point comes in the Act 1 finale, “If I Can’t Love Her,” a personal favorite of the numbers added for the stage. As the self-obsessed man’s man Gaston, the incomparable Jack Cappadona balances his hilarious egocentricity and terrifying sense of entitlement flawlessly. You may recall his last appearance at the Stadium as Quasimodo in The Hunchback of Notre Dame, a role that could not be more diametrically opposed to this one, which truly attests to his range as an actor. The servants consist of Rebecca Donald as the kindly, maternal Mrs. Potts, who delivers a lovely rendition of the title song; her son, Chip, played by Rowan Esposito; Brian Sands as the worrywort head of household Cogsworth; Adam Landry as the stereotypically French Lumiere, who leads an ensemble of enchanted objects in “Be Our Guest;” Stephanie Witz as the seductive Babette with whom Lumiere has a fling and Ashley Lopes as the diva Wardrobe. The only downside were frequent sound issues that often rendered some lines inaudible, which is a common issue among community theaters, but proves particularly troublesome in the large and almost sold-out space at the Stadium. Nonetheless, Beauty and the Beast is a spectacle guaranteed to be enjoyed by audiences of all ages.